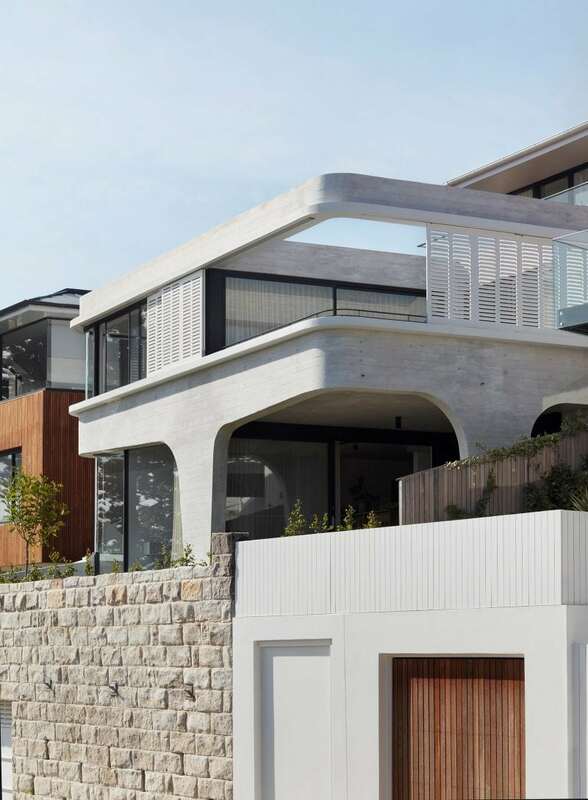 Geographically characterised by steep escarpments that surround the beach (far narrower than its near neighbours at Bondi and Bronte), the homes that cling to Tamarama’s hillsides are a mishmash of ticky-tacky boxes left by the previous generation of beach bunnies, now dwindled by skin carcinomas. Tama’s Tee Home was constructed on what was solid and reusable from the previous house. Approximately fifty-percent of the previous structure was kept, including the large sandstone retaining wall to the front of the home and the garage beneath. 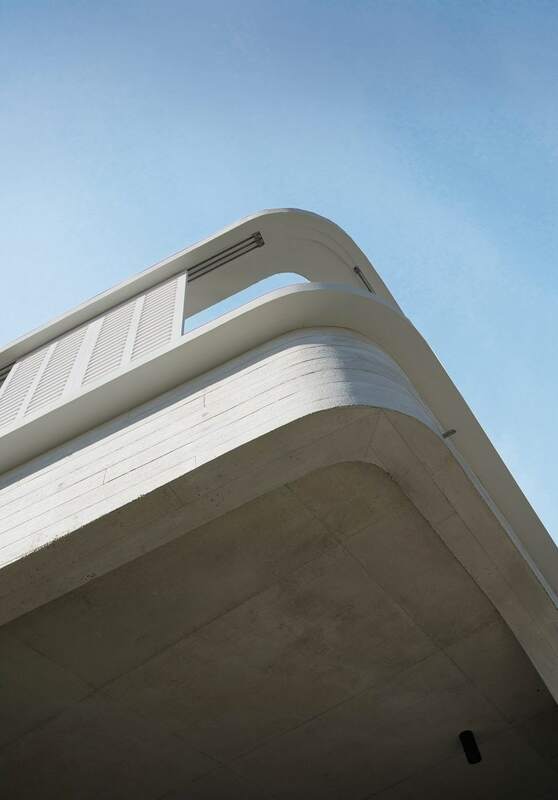 The new concrete ‘Tee’ structure to the front of the house was designed so that it would rest on the single point of the garage structure below that would bear the weight; this explains the ‘unipod’ shape to the front façade of the home and the need to provide it with a solid concrete structure. Oceanside architecture must be designed and constructed with very weather resistant materials: the salt, humidity and wind are implacable agents of rapid decay. If used properly, concrete is quite resistant to such seaside aggression. Marine grade roofing materials and stainless steel fixings are necessary in this position. To adapt to the hillside the house was built over four storeys. 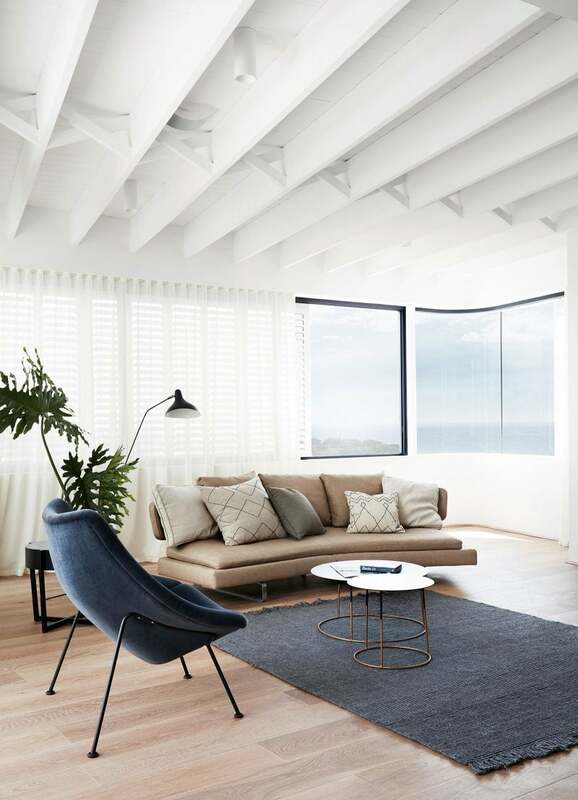 Located on level three, the main living area benefits from ocean views to the northeast and a sheltered terrace to the northwest side that is protected from the strong coastal winds. 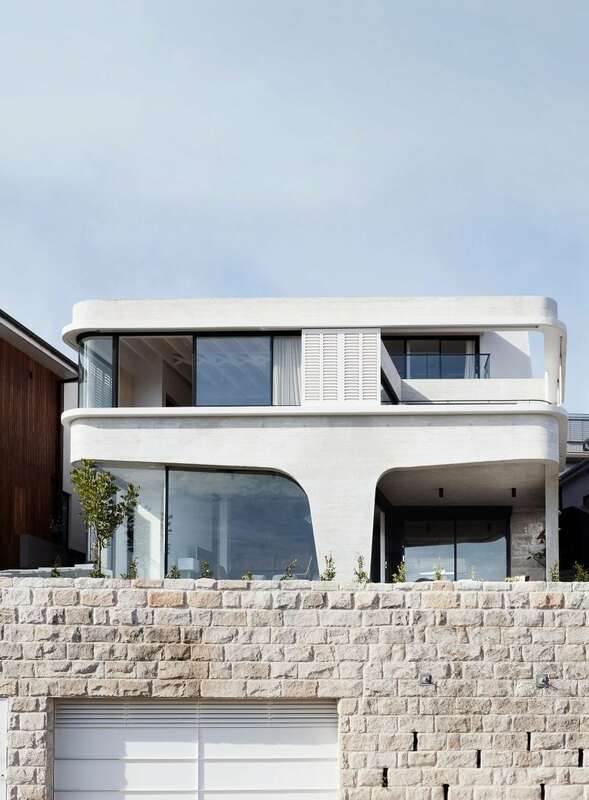 Built above an existing garage and sandstone retaining wall, the new additions balance on the tee shaped concrete pillar splayed out to carry the main living level of the house. 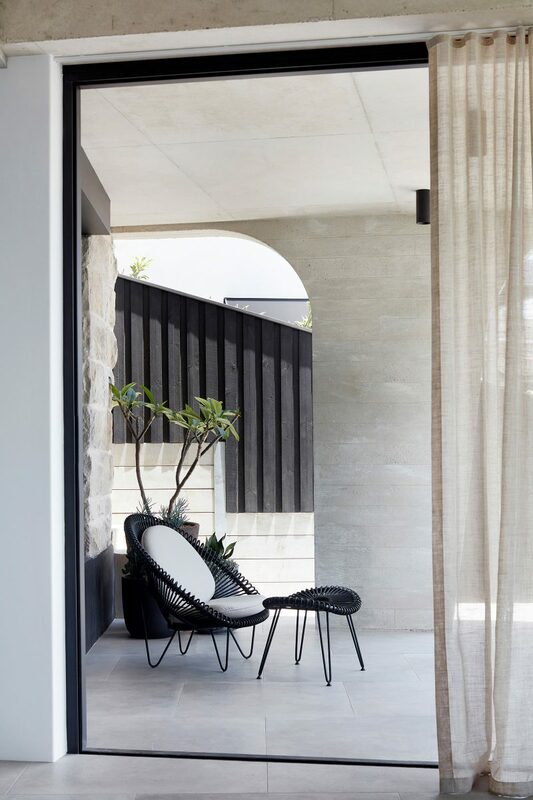 The off-white cement used in the concrete delivers a beachy luminous glow that will, with time, aquire a patina of tan and microorganism growth for the better. CNC routed marine plywood shutters slide in front of the windows and terrace to provide shade or wind protection. 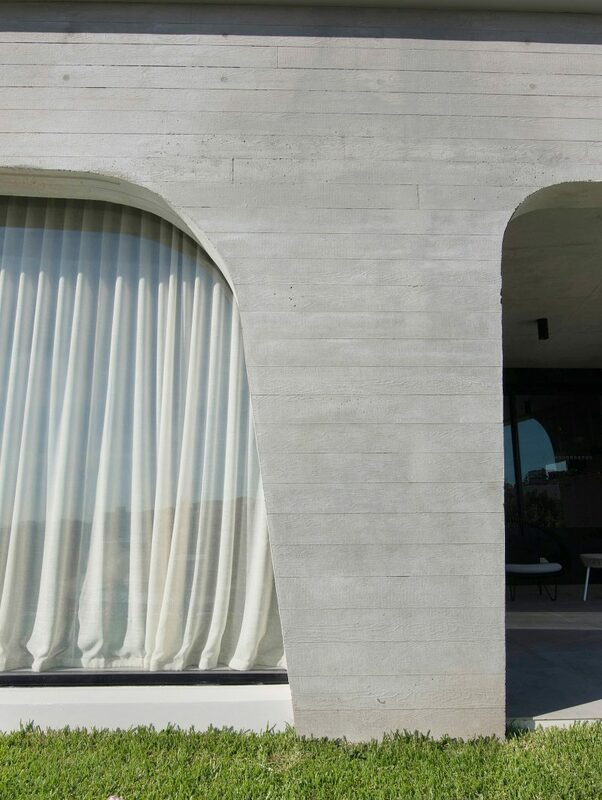 The concrete was formed with woodgrained boards that were skillfully curved at the corners. 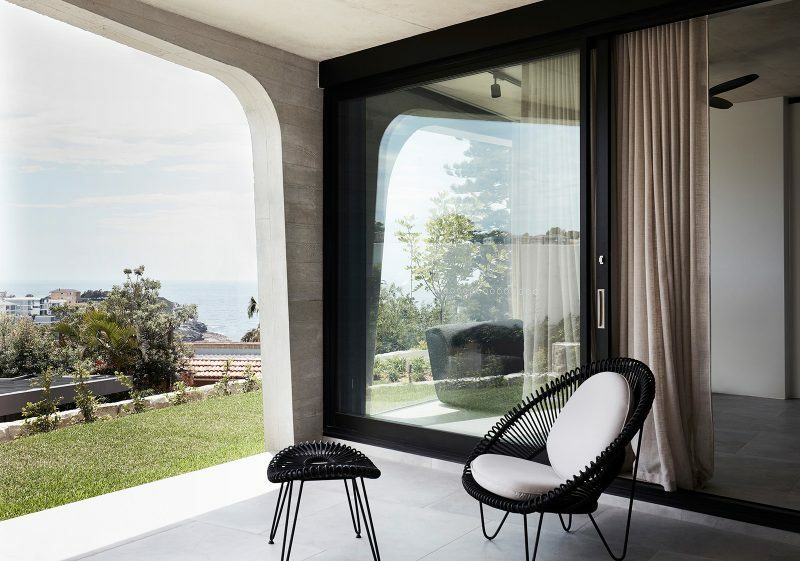 The seamless junction between the pillar and beam, similar to the junction of the nose to the eyebrows, helps to frame the views down to Tamarama and the beach. 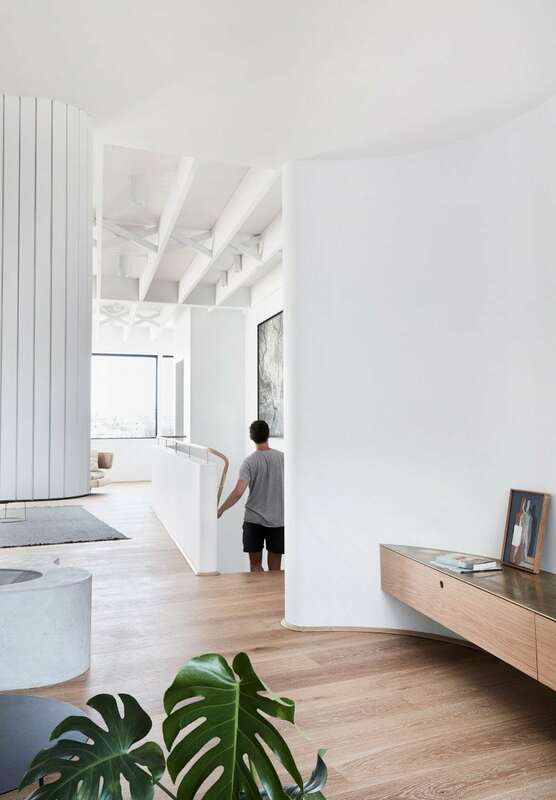 The lower floor of the house is a teenager's pad with rumpus room and a covered terrace. 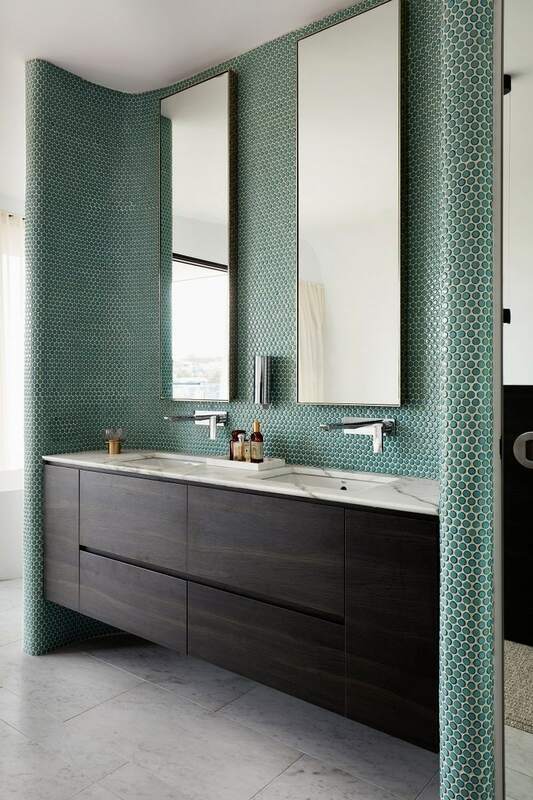 The concrete roof and pillar is reflected in a cement coloured vitrified ceramic tile named "Memory Mood" supplied by Terra Nova Ceramics. 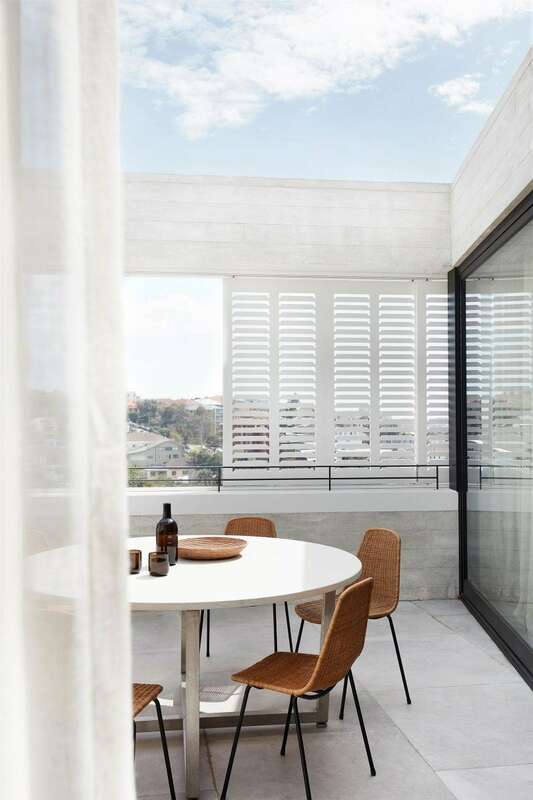 The shutters form private screens when viewed from the street but are see through when the occupants look outward towards the view. 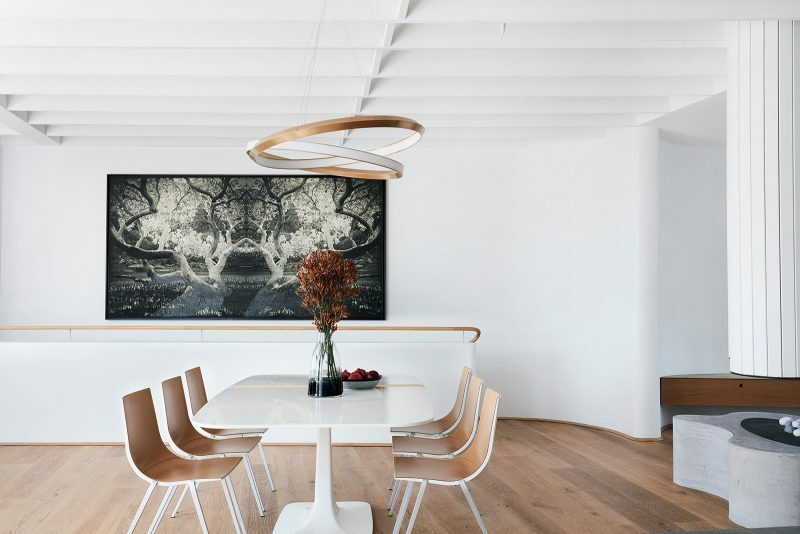 Spence & Lyda's (Gian Franco) Legler Basket Chairs are set around a carrara marble table. If one is bored by the ever-changing views of the Pacific Ocean seascape one can contemplate and wonder on the lines of the ceiling joists, braced with traditional criss-cross braces. The Oyster Chair By Pierre Paulin is designed for ocean contemplation. A Nodi Rug, Ribbed Wool in Charcoal By Nodi was also Supplied by Spence & Lyda. 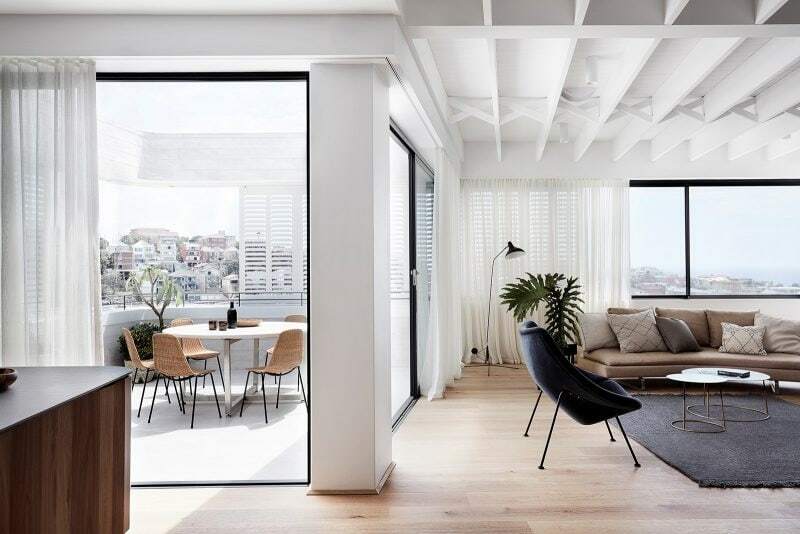 Open Plan, Inside/Outside, flow, seamless design, are all buzzwords for contemporary architecture, and particularly suitable for the Sydney coastal climate. However such concepts require a layering of 'filters': doors, curtains and shutters. The timber floor is Sepia Grande Eterno engineered boards by Tongue N Groove. 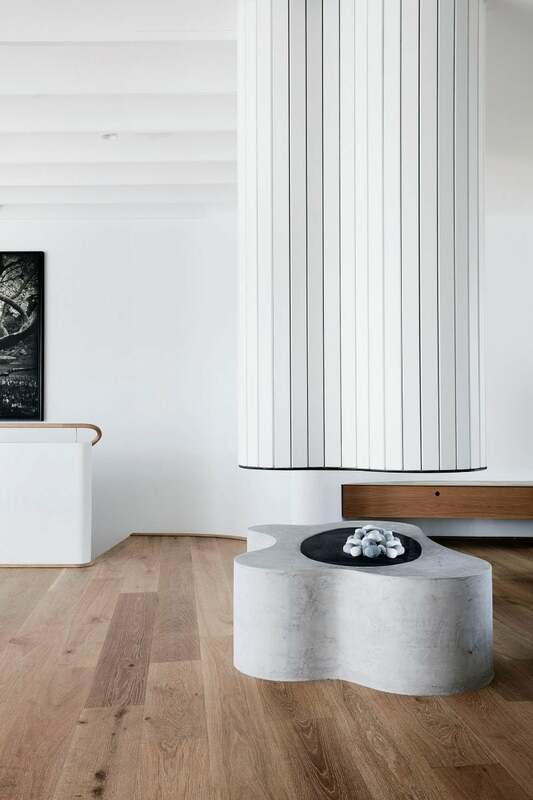 The Roscharch Blotch fireplace, located centrally in the open plan living floor, as with the traditional northern European 'Stube', with its centrally located stove. 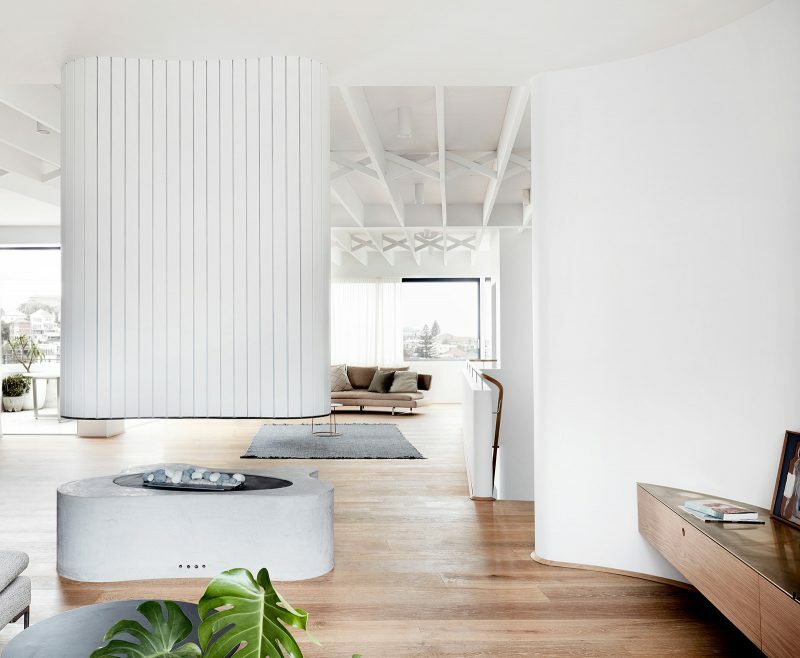 The freeform gas fireplace is the pivoting point at the intersection of the dining room, TV room and kitchen, with the main stair spinning out tangentially. The gas burner is inserted into a masonry base, finished with a Rockcote render. 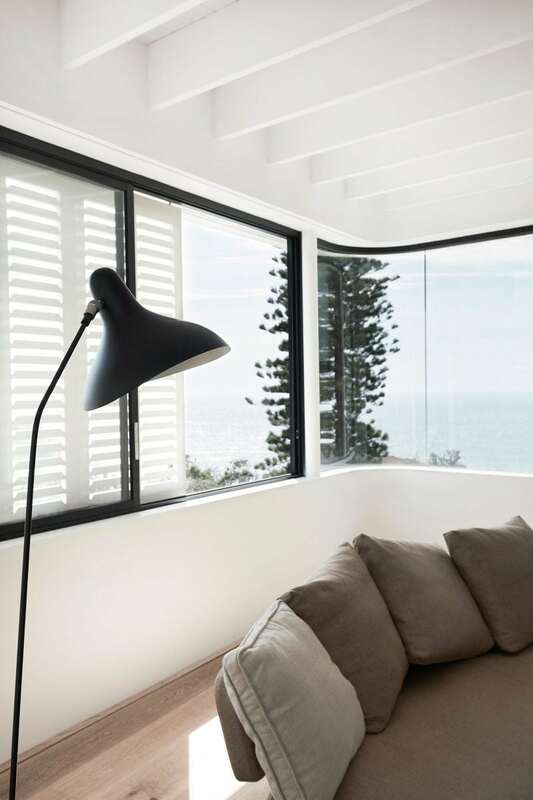 Mantis floor lamp designed by Bernard Schottlander, supplied by Spence & Lyda. Gardens do not grow very well on the salt ravaged escarpments of Tamarama, however Norfolk pines love it. The Romans liked orthogonality, horizons had to have vertical contrasting lines, often provided by obelisks or columns. Seascapes also require vertical elements, such as this tree or a saling mast. The dining area of the open plan living space features an 'Oracle' pendant by Christopher Boots and painting by painting by Joshua Yeldham. 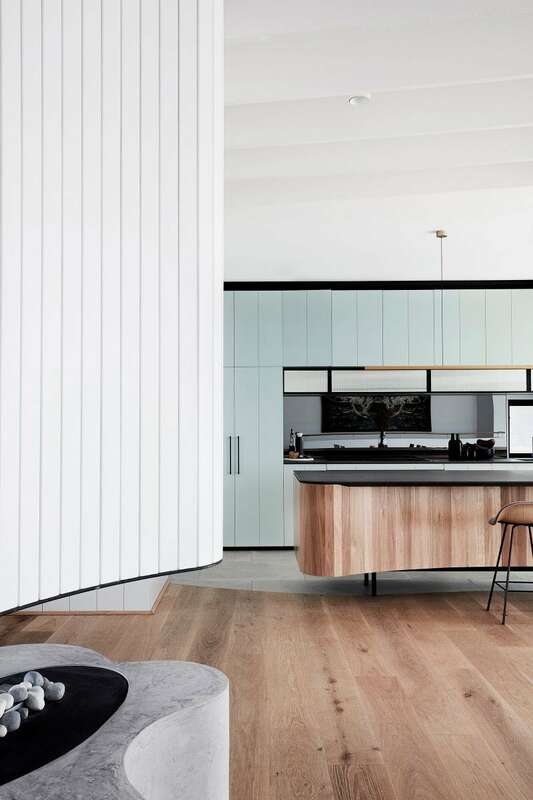 The kitchen joinery was built by builder, Building With Options joinery workshop. 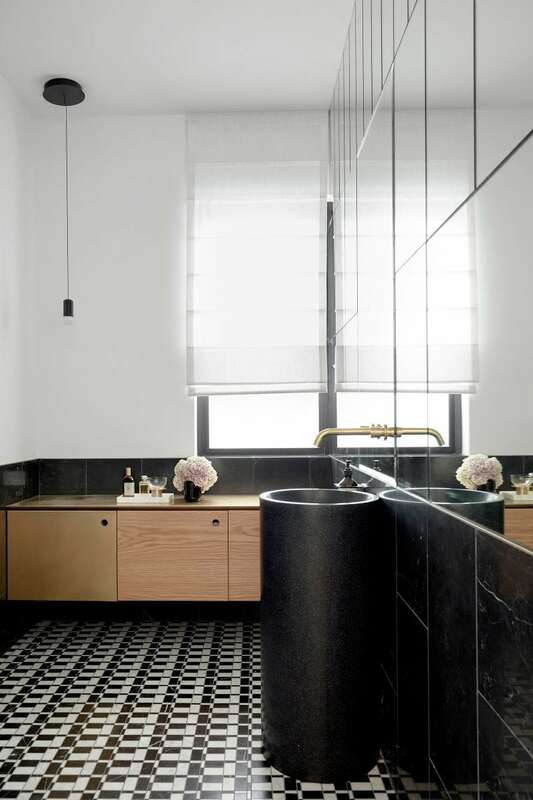 Stone Italiana provided a laboratory grade, reconstituted stone benchtop without the look of fake stone conveyed by the glossy products of their competitors.